The CBP commissioner warns of harsh conditions for those trying to cross border. The nation’s top border official expressed confidence Wednesday that more than 2,000 migrant children currently separated from their parents after crossing the border illegally could be reunited with family in the next month. “I think they’re going to really work at it,” Customs and Border Protection Commissioner Kevin McAleenan said of Health and Human Services, the federal agency now taking care of the children after they were processed by CBP. McAleenan’s comments come one day after a federal judge in California ordered the Trump administration to reunite all separated children within 30 days, and children five and under within two weeks. (ABC News) The view from inside a helicopter flying along the U.S.-Mexico border in Arizona. The helicopter was carrying Customs and Border Protection Commissioner Kevin McAleenan and an ABC News crew. The Justice Department would not say whether it plans to appeal the order. ABC News accompanied McAleenan Wednesday on aerial and ground tours of Arizona’s harsh border environment outside Tucson: desolate mountains stretching for miles on end, followed by vast deserts filled with just brush, dirt and rocks. With a blazing sun beating down on the terrain, the ground reached temperatures topping 150 degrees, according to an infrared thermometer used by ABC News. Each year, about 400 migrants trying to cross the Arizona border illegally die in the desert before they finish their journey. Meanwhile, each day, Border Patrol agents apprehend about 150 migrants who successfully make it across the border. McAleenan insisted illegal border crossing is not worth the gamble. 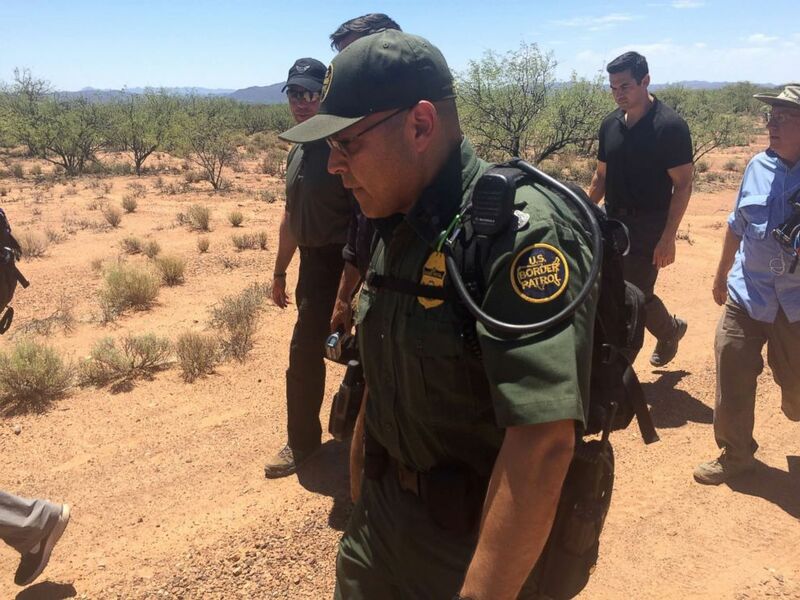 (ABC News) Customs and Border Protection Commissioner Kevin McAleenan, in sunglasses and hat, walks with a Border Patrol agent and an ABC News crew through the desert along the Arizona border. June 27, 2018. In the Tucson sector alone, CBP has set up 34 “rescue beacons” — towers fitted with phones to call for help and blinking lights visible from miles away. Each year, CBP is called to rescue 4,000 illegal border-crossers who reach a point of desperation. 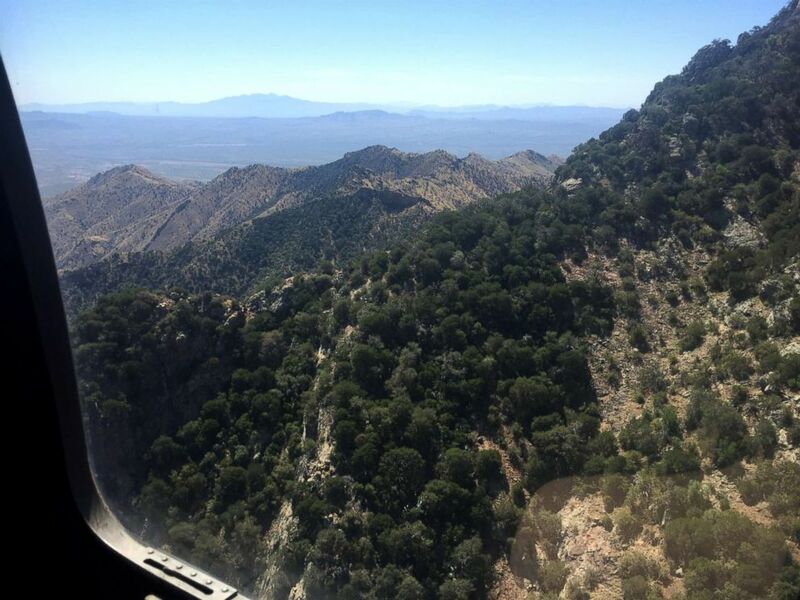 While in a helicopter above CBP’s Tucson sector with McAleenan, ABC News witnessed CBP respond to a man and woman at the top of a 5,000-foot mountain who called for help. He was “left out on his own,” McAleenan said incredulously. “That’s how callous the smugglers can be about human life, a child,” he added. For nearly two hours, ABC News marched with McAleenan through the harsh Arizona border area for nearly two hours. The trek amounted to a fraction of the time migrants have to spend struggling to make it into Arizona. Halfway through the hike, ABC News asked McAleenan how he was feeling. But, McAleenan added, the harsh conditions along the Arizona border also underscore “how hard” Border Patrol agents and others are working to rescue people and secure the border. At the end of the hike, McAleenan said he had just received disconcerting news out of Washington.